It's that time of year again! 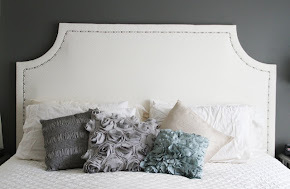 Time for some spring cleaning, organization and purging! As much as I hate cleaning, it's really hard to deny how good it feels to open up all the windows and let the breeze blow into your thoroughly scrubbed house, free of crap/clutter, which smells lemony-fresh. 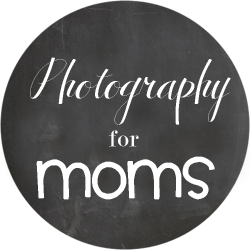 Today I'm joining forces with an amazing group of mom bloggers to bring you all kinds of posts on spring cleaning and organization. We've got everything - including how to get your kids involved in cleaning (right here! 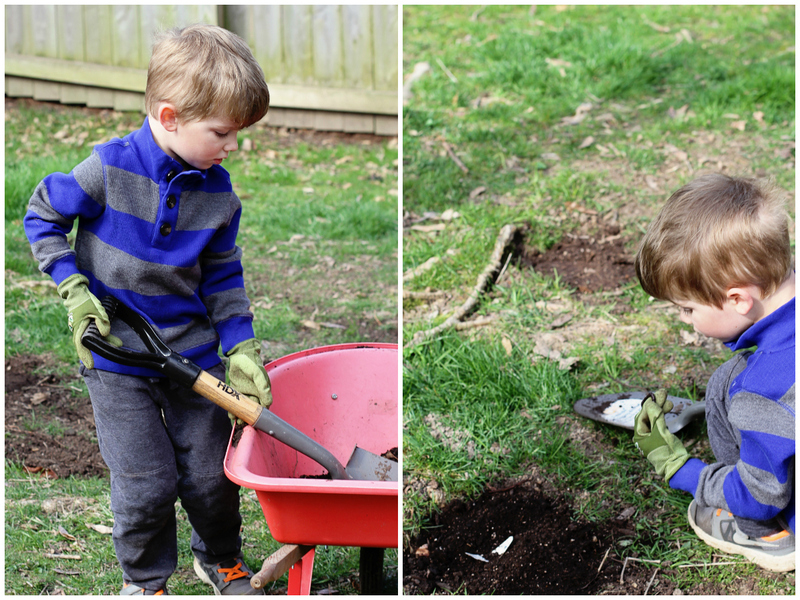 ), spring cleaning printables/schedules, prepping a spring garden, organizing closets, favorite essential oils for cleaning and much, much more! 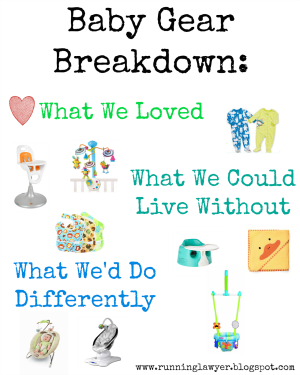 See the list at the end of this post for all the topics and links to each blog post. ALSO - there's a fun little spring cleaning GIVEAWAY at the end of this post to help you with your cleaning, so keep reading! 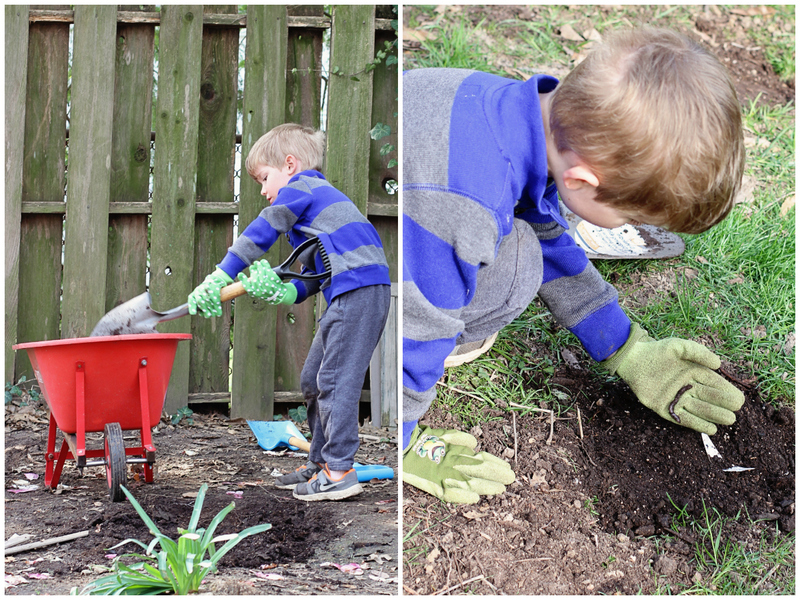 One of the best (and worst, sometimes) things about the kids getting older is that they want to do everything I'm doing. I love that they want to help, but let's face it...one and three-year-olds usually make more messes than they help clean up. 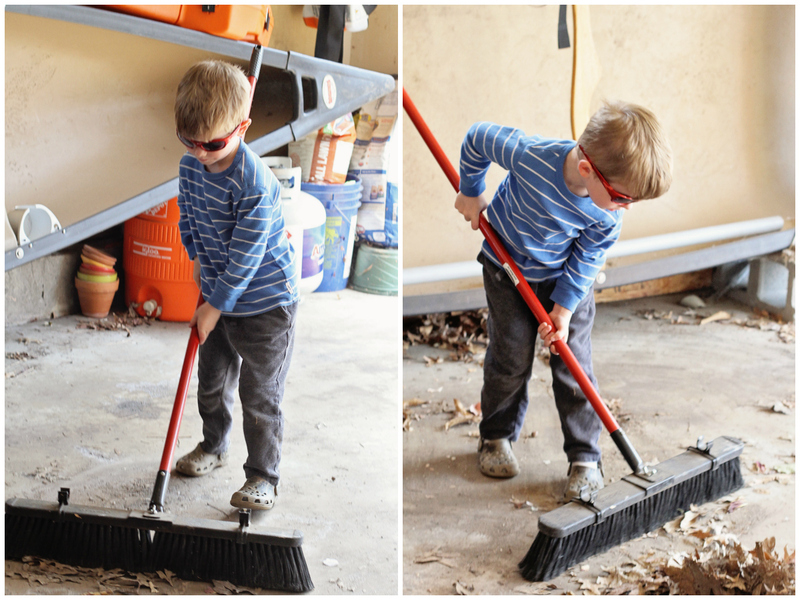 However, we have found some things that toddlers, preschoolers and little kids can help with, that they love doing and (if properly supervised) doesn't cause too horrible of a mess! 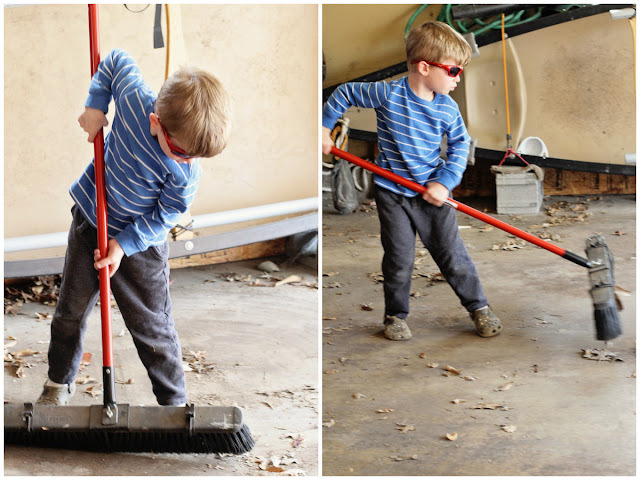 I try to involve the kids in cleaning around the house as much as I can, even if the chore isn't something that they can completely do on their own. My theory is that they'll get a little better at the project each time they do it and eventually will be able to do some of these things on their own and be proud of themselves for helping out. Or this could totally backfire and they'll both despise helping me with anything around the house by the time they're five. You never know! Mac, in particular, is a great helper. He loves "projects" and is one of those kids that just gets into trouble if he's not focused on something or involved in whatever it is that we're doing. We've gotten very good and figuring out what projects he can do on his own, what he can do supervised and what he wants to do, but still needs help with. At almost-four, he's a big help around the house when he wants to be - the key is getting him motivated and making him feel like he's doing independent tasks that help everyone out. We have a list of chores stuck to the refrigerator that he can do on his own, which we give him anytime he's bored and needs a good distraction. 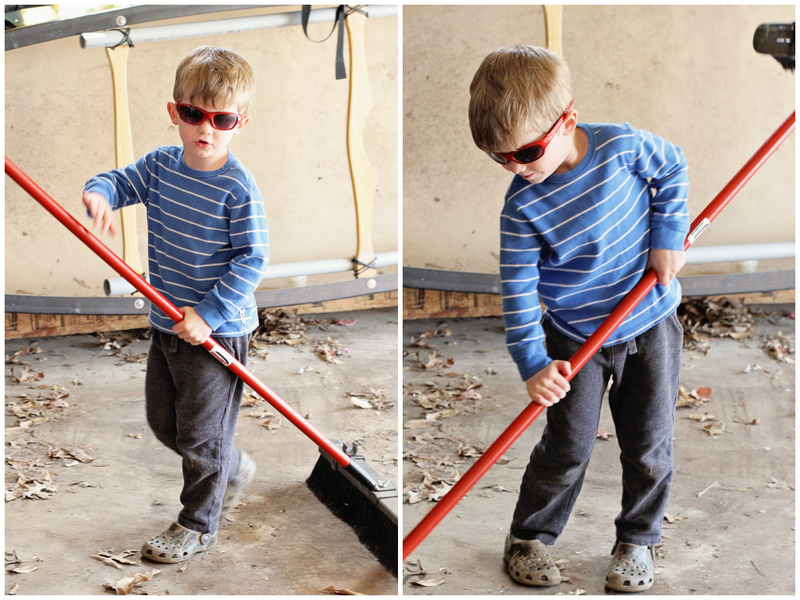 Here's a great list of chores that are appropriate from kids 18 months - 5 years old. Mac's favorite chores are vacuuming with the Dust Buster (which he received from Santa last year! ), washing the windows, sweeping the garage, raking the leaves, shoveling snow, watering the plants and helping with the landscaping outside. Not surprisingly, the dirtier the job and the more gear it involves, the more he loves it. Also, anything that Ryan does, Mac wants to do too...from washing the cars to mowing the lawn to blowing leaves and taking out the trash. Daddy is his hero and if he's doing it, Mac wants to do it too. Mim, on the other hand, likes straightening up. She loves putting away her toys, feeding the dog, washing the dishes, stacking books, putting away shoes, emptying the trash, putting clothes in the hamper, putting away laundry and bringing in the mail. She likes the Dust Buster, but she's not a big fan of the loud vacuum, the leaf blower or the lawn mower. Mimmy's on the young side to be doing chores and helping around the house, but she's much better at it than I ever thought to give her credit for. 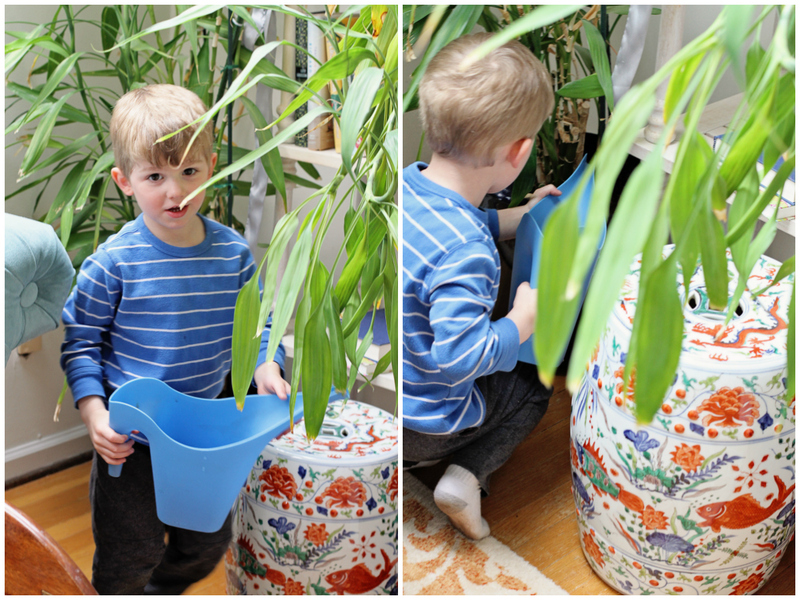 One of the best ways I've found to get the kids involved is to give them their very own cleaning products in a little cleaning caddy. 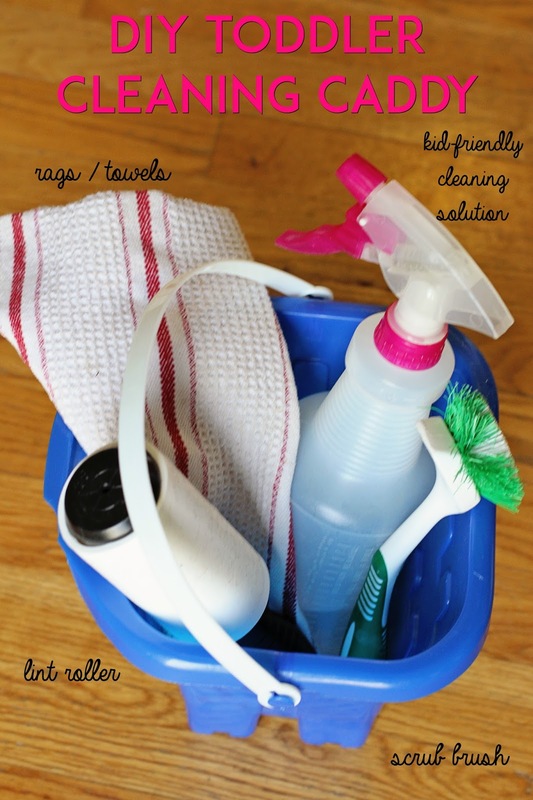 We had a couple of sand pails in the basement that I grabbed one day and threw in a couple old dish rags, a lint roller, an old dish scrub brush and a squirt bottle filled with a kid-friendly cleaning solution that I made from water, lemon essential oil and vinegar. Other things you could include: baby wipes, duster, sponge, microfiber cloth, dust pan & hand sweeper. 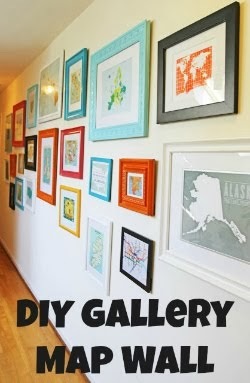 You can get as creative as you want with this and kids love it! 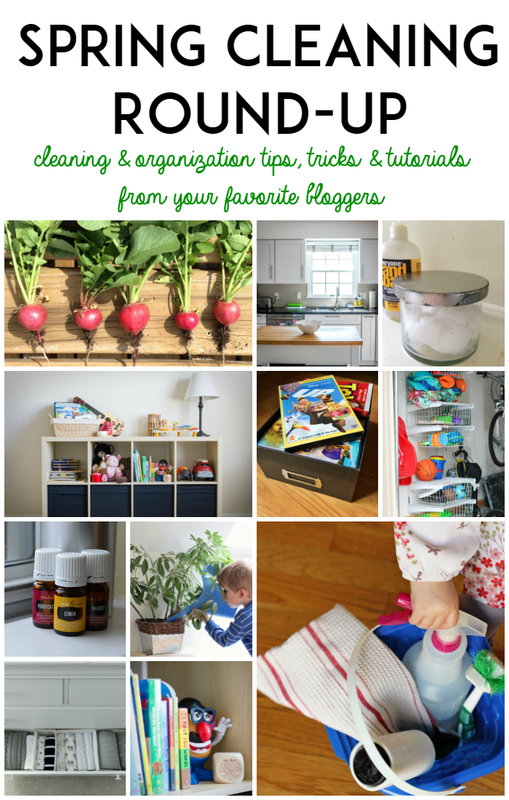 Here's a list of the rest of the amazing bloggers involved in the Spring Cleaning & Organization Round-Up. Make sure to go check out their posts for additional inspiration, tips, tricks, advice and tutorials. And don't forget to enter below to win one of FOUR Mrs. Meyer's Variety Gift Buckets to help you with your spring cleaning! Best of luck to you! 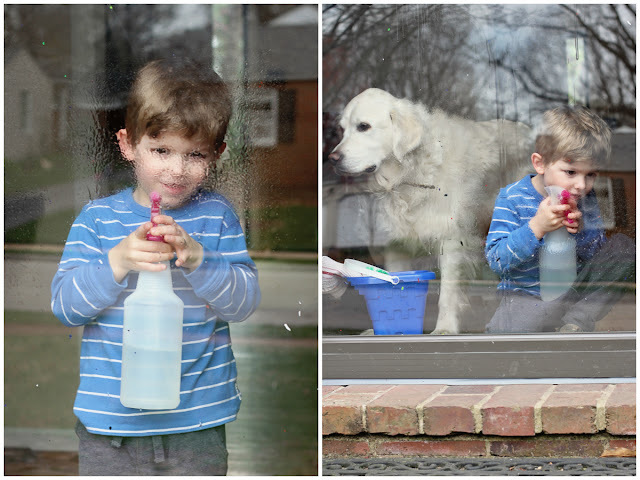 Do you get your kids involved in cleaning? 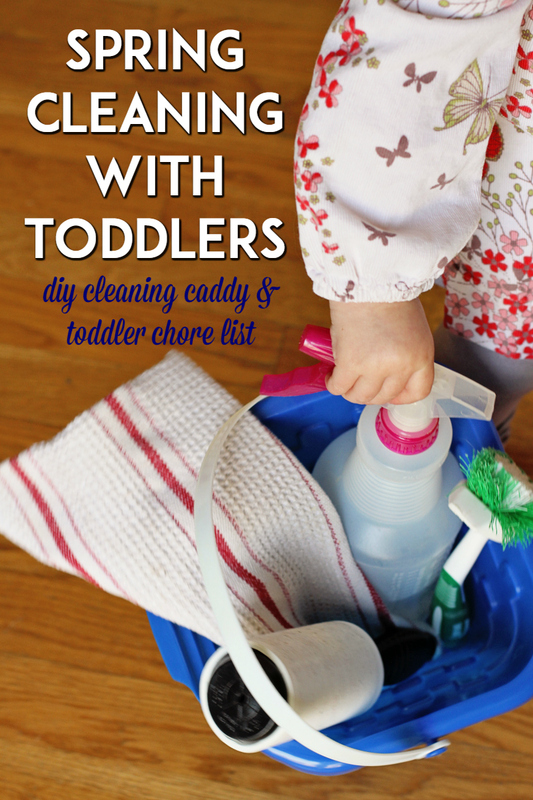 Love it... What a great list and cleaning caddy! I have Noah help a lot (sometimes I like it sometimes it's a pain lol). 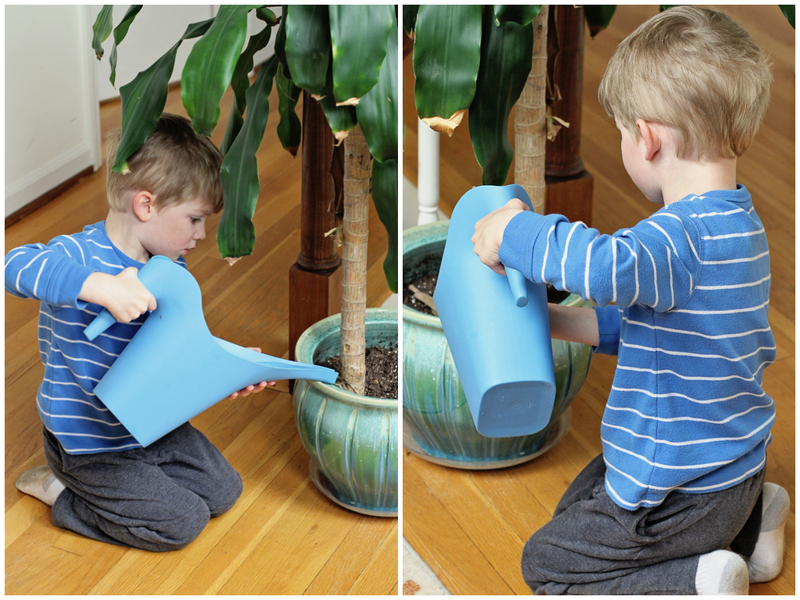 He's a fan of dusting, vacuuming, sorting socks, and watering plants. He's also good at putting his shoes and coat away when we get home. But I might make the recycling bin his job to bring in now that the weather is getting nicer! Thank you so much for posting this. 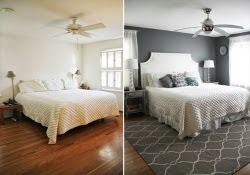 I was literally just thinking as I looked around at my disaster if a house that I needed some tips and tricks!! Couldn't have come at a better time! What a great way to help keep kids grounded and instill in them a sense of self worth and work. Well done! Such great ideas! 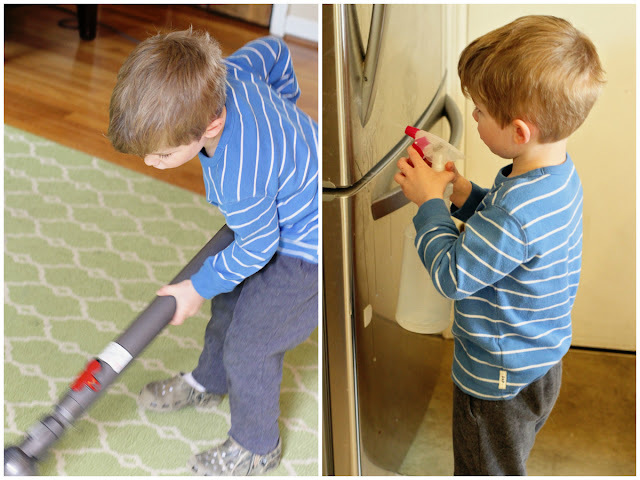 I'm guilty of not letting my kids clean as much as I should because let's be honest, it's quicker and easier if I do it myself. When I do ask them to pick up toys, I try to make it into a game. (Who can pick up the most balls/blocks/gears/cars?) 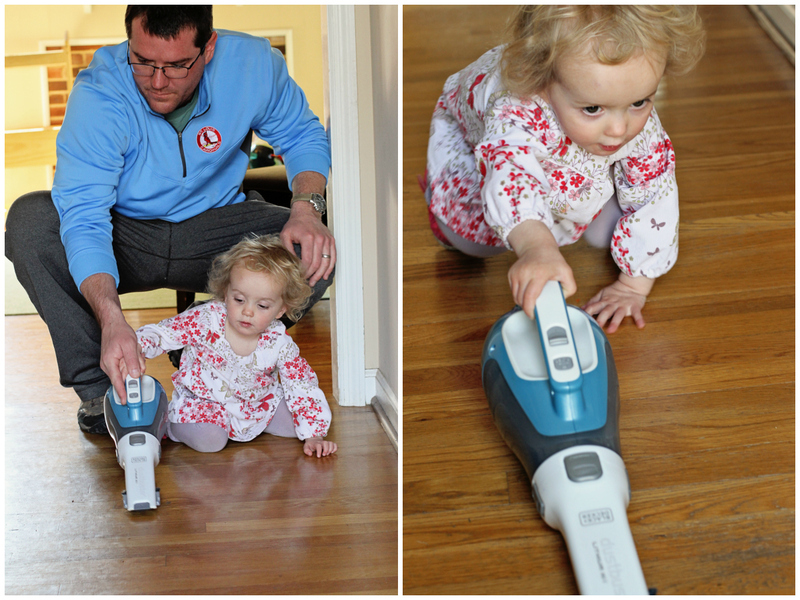 However, both of my kids love using our Swiffer vacuum, which I consider a win-win! I love your kids' caddy idea and I LOLed about Mac getting a Dust Buster from Santa! Whatever it takes! Thanks for organizing this amazing collaboration of posts! Such great (& cute) helpers. I love the idea of them having their own caddy especially, it's always nice to involve them!! Elin just started to like helping clean up. It's a little painful with how slow she is but I am trying to let her help so eventually she grow into more of a helper. Can you send those two little cuties my way, I have a few things I could use help with! This is so great! My kids love to help too. What a great idea to make them their very own cleaning caddy. PS-Mac in those sunglasses... I die! Such cuteness! I love that you let the kids help you so much! I have slowly been starting some spring cleaning and we are having company over both Saturday night and Sunday afternoon this weekend. I plan to blast some music tonight and get cleaning! Great idea Sara!! I love getting he kids involved. Emmy is good at trashing and then picking up. Ha ha! Cam loves using our handheld dyson. And he's good with it which is so helpful!! I want to start having him do certain little chores to earn money so he can buy his own toys. I mean the only reason I had a child is to help with household chores! Ha, yeah right! Those little mess makers. 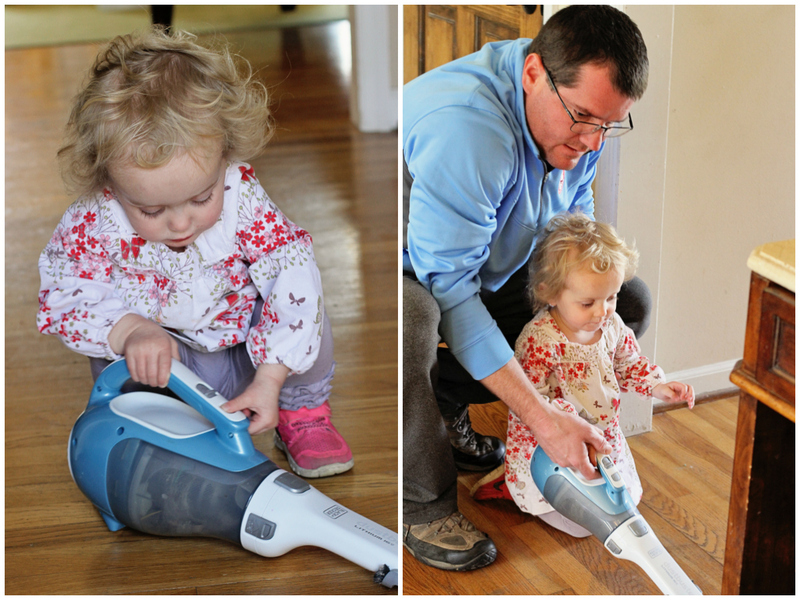 I can't wait until P wants to use our dust buster because I know a certain dog who's middle name should be shed. Arden would lose her mind if I got her her own cleaning caddy! And seriously...pulling weeds is one of her favorite pass times ;) Thanks for all the ideas!!! This list is PERFECT. I've been thinking of ways to have Connor help me in and outside the house and you've given me a ton of ideas. Mac looks like a great helper! XOXO My girls love to clean..which I love! My tween boy not so much, but he DOES change explosive diapers like a pro! Thanks for sharing your list! Such a great idea!! 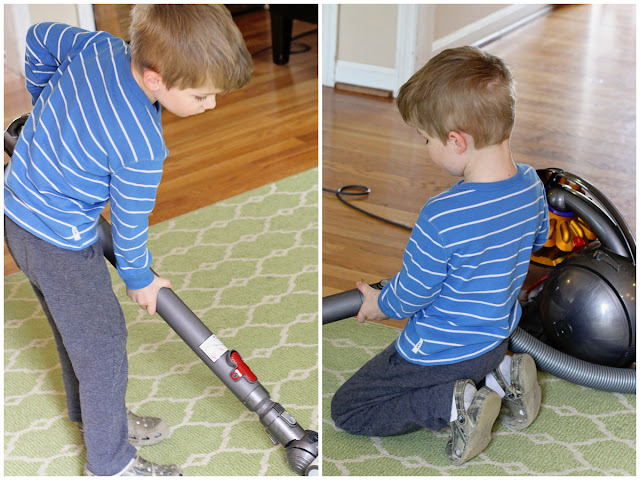 Wyatt's favorite chore is vacuuming!! And I am not complaining. Genuis! Just the other night Kinsey spilled some shredded cheese and had so much fun using a hand vac to clean it up! Mac looks like he's having a little too much fun helping out ;) Brielana is my little weed puller, girl likes to get her hands dirty. Aw, love this!!! Waverly is into it now too, she needs her own caddy!!! 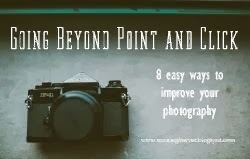 LOVE these tips Sara! I need to get Hudson to help me out more! You have such good helpers!! I love that they are excited to help you out with things around the house. Start them young! 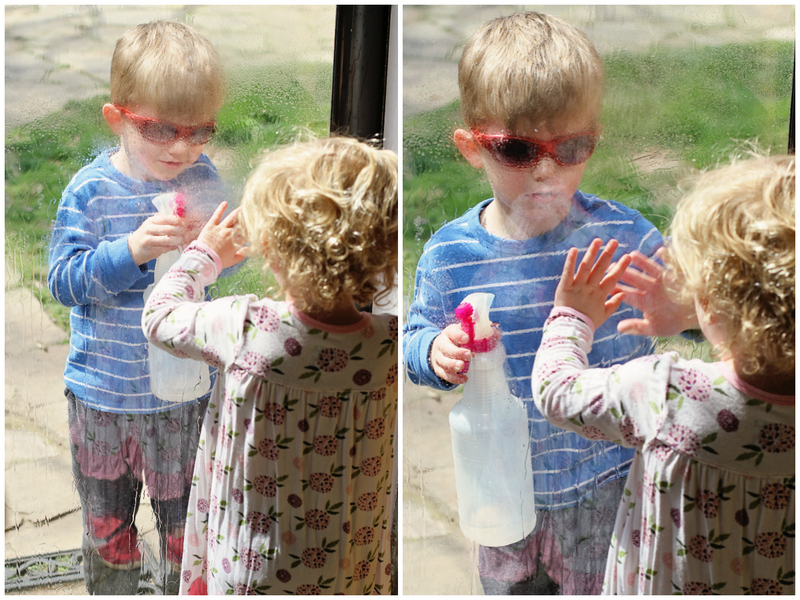 Oh my, Mac is so so cute with the spray bottle! Liam is obsessed with wanting to spray down tables and wipe them up. So much spray! I actually don't have him clean up intentional messes because it's practically a reward, ha! 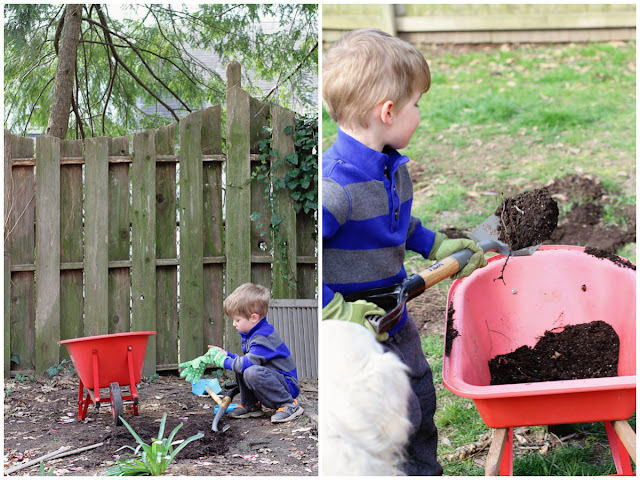 I am flat out amazed at how helpful both your kids are! Mim especially, she's younger than Sophie and does so much! The pictures of them are so adorable, especially the dust bunny vacuum. Right now Sophie loves sweeping and vacuuming although our vacuum is far too large for her to easily handle so she usually just sticks to sweeping with a short broom. She loves picking up her messes as well, so much so she'll make the mess to pick it up. Somewhat productive...Along with the fact that she loves wiping things down with wipes, paper towels anything haha. Great tips, friend! And adorable pictures. I think Sunday after church will be a big ol' Spring cleaning day for us. And now I know which projects Mason would love to help with! What kid doesn't love spraying things? Great! These hand tools are always handy and suitable for children, including a vacuum cleaner. 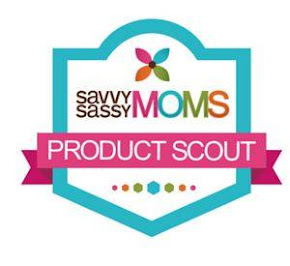 Do not forget to visit my blog to find out more detailed assessment of these products!